Why Use Achex Server ? It saves development time! Achex Server is a platfrom for developing New Age Apps. It provides and handles web network ressources and has a simple interface. Long version: Achex Server provides a simple data messaging system between browsers, programs, embeded devices, etc. You have and idea for a web-app or web-interface for an app? We provide a fast way of implementing your idea! You don't need to worry about the Server Implementation is already done! Websockets are the interface between you web application and the Internet. They are a building block in a big system. Achex WebSocket server provides a base architecture using these building blocks on which you can add your own framework. The analogy is getting a jet engine (Achex Server) and all you need to do is build the frame(web-app) around it and you have a jet plane. A WebSocket is a means of communication between browsers and programs by use of packets. Websockets are a mean of communication between programs. In normal programming, a socket is a means to access and control the network card using the TCP/IP protocol (or UDP protocol). The socket provides a stream of data. The main difference between a normal socket and a websocket is that sockets are stream oriented and websockets are packet oriented. In fact, websockets are build on top of normal sockets with a predefined protocol (websocket protocol - RFC6455). Thus the stream comming from a normal socket gets chopped into packets and given as the output (or input) of a WebSocket. WebSockets enable webpages and custom applications(C/C++, scripts, etc.) to communicate data between eachother with low-latency. It is very effective for data streaming and communication. What is a WebSocket Server? 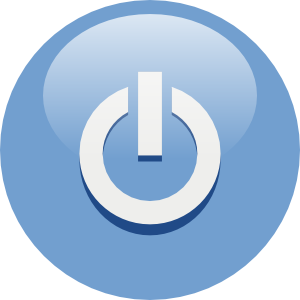 A WebSocket Server is a meeting point for all clients, being webpages, apps or even embeded systems. The websocket protocol is a client-server protocol. Basically the WebSocket server accepts client connection from webpages, apps or embeded systems and relays data according to the client's request. This enables many applications in different industries: industrial, entertainment and even advertisement. Check out the Application section for ideas using websockets in different industries. What is Achex WebSocket Server? Achex WebSocket Server enable you to jump directly to web-app design and/or custom application design. This server provides non-stop, maintained service as well as a JSON based communication/messaging architecture between clients and your apps/web-apps. Compatible with PC, MAC, iPad, iPhone, Android, Linux, virtually ANY OPERATING SYSTEM that has a HTML5 compattible browser as well as ANY APPLICATION (program or script) using Achex websocket client APIs. Achex WebSocket Server provides a reliable meeting point for all your applications and your users. This enables you to build many applications without getting into the complexity of writing, hosing and maintaining your own server. One application is a simple chat application which can be fairly simple to make (see development section). Imagine combining serveral technologies together with websockets. Look at webGL and/or HTML5 CANVAS and webosckets. Real-time Multipleyer games in the browser become very easy to build and by using Achex WebSocket server, you can spend more time on designing your interface and game experience. From the Industrial point of view, look at the new FPGAs with integrated ARM processors running linux, add an ethernet chip, add some Analog To Digital converters, write a small C/C++ embedded application using the client websocket APIs provided on this site, write a small webpage that also uses websockets and you can make a real-time sensor monitoring over the WEB. 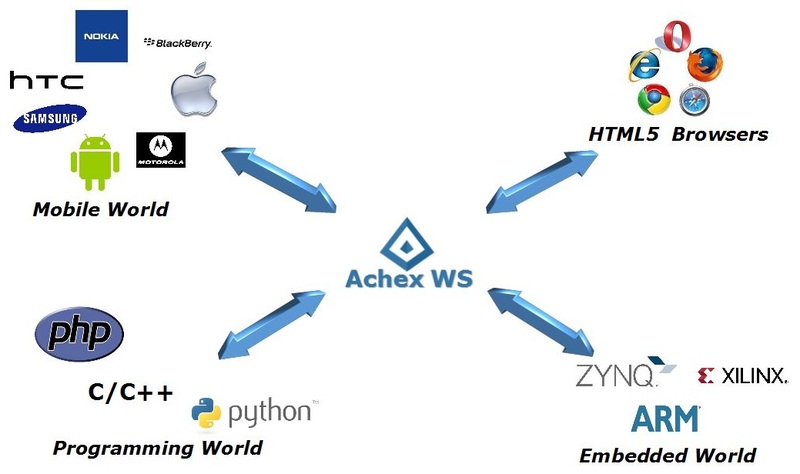 By using Achex WebSocket server, both the webpage(user interface) and the sensor can connect as clients to Achex Websocket server and can communicate with eachother from anywhere in the world through the internet. This is actually one of the Industrial applications that we used/experimented. Take a look at our development page and start writing your own web-apps or applications now. BY USING ACHEX WEBSOCKET SERVER AND COMMUNICATION SERVICE AND ANY SERVICE PROVIDED BY ACHEX AND THE CREATOR OF ACHEX SERVICES YOU SIGNIFY YOUR AGREEMENT TO THESE TERMS: YOU AGREE TO USE THE SERVICES PROVIDED BY ACHEX AND ITS CREATOR WITHOUT CAUSING ANY HARM IN ANY DIRECT OR INDIRECT WAY TO OTHER PEOPLE, USERS OR THE SERVICE ITSELF. YOU AGREE THAT YOU, HENCEFORTH KNOWN AS 'THE USER', ARE LIABLE FOR ANY DAMAGE THAT IS CAUSED BY YOUR DIRECT OR INDIRECT USAGE OF ANY SERVICES PROVIDED BY ACHEX. YOU AGREE THAT ACHEX AND THE CREATOR OF ACHEX SERVICES IS NOT LIABLE FOR ANY CLAIM, DAMAGES OR OTHER LIABILITY, WHETHER IN AN ACTION OF CONTRACT, TORT OR OTHERWISE, ARISING FROM, OUT OF OR IN CONNECTION WITH THE SERVICE AND ITS USAGE INCLUDING LOSS OF DATA AND/OR MISUSE OF THE SERVICE.